Ethers are the family of organic compounds by the general formula, CnH2n +2O. They are isomeric by the aliphatic monohydric alcohols with the general formula CnH2n+1OH. Epoxides are formed whenever an oxygen atom is associated to carbon atoms of a carbon chain making a three membered ring. Ethers acquire the structure: R-O-R'. R and R' might be aliphatic or aromatic. Symmetrical ethers are the compounds in which R and R' are similar, they are as well termed as simple ethers. Unsymmetrical ethers are the compounds in which R and R' are different, they are as well termed as mixed ethers. These are the compound having the oxygen atom in a ring. They are heterocyclic compounds. The three membered cyclic ethers are termed as Epoxides. Dissimilar to most ether, Epoxides are extremely reactive substances. Ethers can be named by using the common system or the IUPAC system. Common System: In the common system, ethers are named via prefixing the names of alkyl radicals joined to oxygen in alphabetical order prior to the name ether. For example: CH3-O-CH3 is termed as dimethyl ether and CH3-O-C2H5 is simply ethyl methyl ether (that is, in alphabetical order). 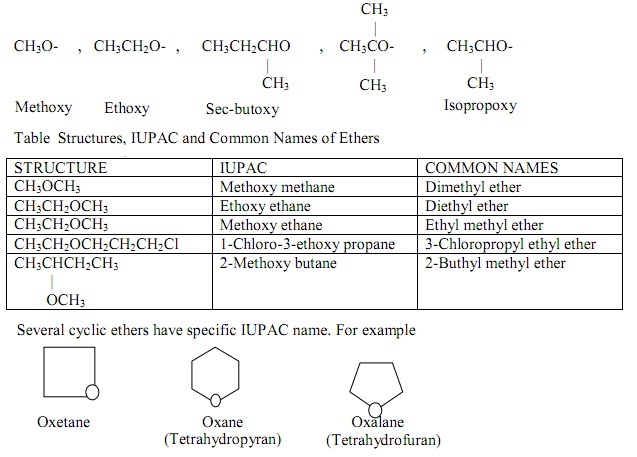 IUPAC System: By using the IUPAC nomenclatures, ethers are termed as alkoxy derivatives of alkanes. The prefix, 'OR' is composed of the name of the simpler alkyl group in the molecule by the '-yl' ending substituted by the '-oxy'. The alkoxy prefix is then followed via the name of the corresponding alkane of the other alkyl group in the molecule. In each and every case, the ring is numbered beginning at the oxygen. Tetrahydropyran and tetrahydrofuran are the acceptable synonyms for oxane and oxalane correspondingly. Some of the substances have more than one ether linkage, for illustration the diethers, 1, 2-dimethoxyethane and 1, 4-dioxane and the triether, diglyme. Compounds that have some ether functions are termed to as polyethers. Ethers show the given kinds of structural isomerism. Ethers are isomeric with alcohols as both encompass the similar general formula (CnH2n+2O) however different functional groups. For illustration, Methoxymethane (CH3OCH3) and ethanol (CH3CH2OH) have the similar molecular formula, C2H6O. Ethers show Metamerism due to the difference in the size of the alkyl groups joined to the oxygen atom. For illustration, the formula C4H10O symbolizes three isomeric ethers or metamers. Expand your confidence, grow study skills and improve your grades. Since 2009, Tutorsglobe has proactively helped millions of students to get better grades in school, college or university and score well in competitive tests with live, one-on-one online tutoring. Using an advanced developed tutoring system providing little or no wait time, the students are connected on-demand with a tutor at www.tutorsglobe.com. Students work one-on-one, in real-time with a tutor, communicating and studying using a virtual whiteboard technology. Scientific and mathematical notation, symbols, geometric figures, graphing and freehand drawing can be rendered quickly and easily in the advanced whiteboard.